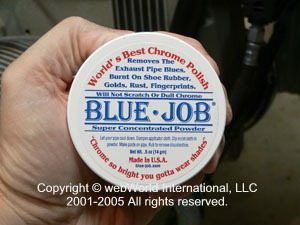 Our recent review of Blue Away motorcycle exhaust blue remover brought several emails from webBikeWorld visitors, all recommending Blue Job chrome polish as an alternative. We quickly ordered a container and came to the realization yet again that it’s better not to be too obsessed with removing that blue color on your bike’s exhaust pipes. lus $4.00 shipping for a 0.5 ounce (that’s a miniscule 14 grams) container. bike — the Tiger’s exhaust pipes are not chrome plated! 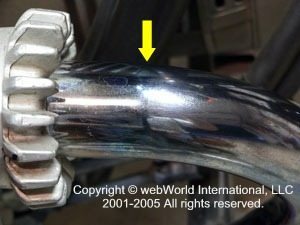 We’re probably asking too much by trying to restore the nearly twenty-year-old BMW R65’s exhaust pipes; over the years they’ve become stained and scratched and have way more problems than a simple blue sheen. But Rick has dreams of showing the Beemer next year during its twentieth birthday, so we’ve been experimenting with various ointments and restoratives to see how much of its youth and vigor can be brought back for the judges. The R65’s pipes do have a mottled coat of blue, starting right at the exhaust nut on the front of each cylinder and extending down around underneath the bike. The Blue Away product we tried just a couple of weeks ago seemed to have no effect at all on the exhaust. Blue Away is a blue creamy liquid substance that’s applied just like a paint polish or wax. Blue Job is quite different; it’s a white odorless powder. The directions call for mixing it into a paste with a little bit of water and spreading it on the exhaust pipe. Where the Blue Away product had a gritty feel, Blue Job seems to do its stuff with some type of chemical reaction. I had a tiny open cut on my finger and the mixture stings, so I’d guess that has some type of acid, but the company claims that the formula has a “balanced pH” that can be used by people with chemical sensitivities. The mixture quickly turns to a white liquid as it’s being rubbed on the pipe, and the blue color on the exhaust does seem to disappear without much fuss. The Blue Job package claims that it will remove “the exhaust pipe blues, burnt on shoe rubber, golds [sic], rust and fingerprints”. Does anyone know what “golds” are?? Unfortunately, although Blue Job claims to remove “bluing or discoloration and surface rust”, it did not remove the brownish stains and other baked in and caked on dirt on the R65’s vintage pipes. Blue Job carries a “100% guarantee” by the company, who states that they offer a “100% refund of purchase price, if not completely satisfied”. It’s not easy to take a photograph of something as shiny as chrome under lights, especially with the limited exposure range of a digital camera. Even the R65’s old pipes have too much shine left for the camera to fully capture the differences in coloration. Area treated with Blue Job to the right of the yellow arrow, bluing to the left. Section of exhaust pipe treated with Blue Job is indicated by the brackets. The bluing on either side is readily apparent. Use on: Chrome. Made in: U.S.A. Product Comments: Works fairly well at removing exhaust pipe bluing, but did not remove the more serious stains on our admittedly older BMW exhaust pipes. From Jeff McKenzie, Blue-Job Mfg. Co.: “This is the real history of Blue-Job, by the inventor, me – Jeff McKenzie. Thank you for the review about my product. I will tell you 2 things: There is NO acid in Blue-Job. It is a de-oxidizer, (oxygen hungry molecule). This is the first time in 18 years I have ever told this true story about how Blue-Job was born. I hope this makes sense. I am a crystal scientist, gemologist and specialize in high-end emeralds from El Chibor, El Muso mine in Colombia, and various Madagascar mines. I design micro crystalline relationships that are so small that they cant be seen without an electron microscope (magic white powders). I actually designed a better final polish for emeralds. 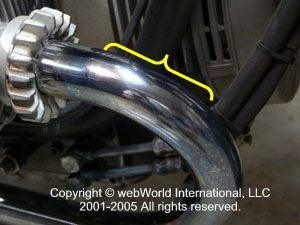 An old buddy of mine (I’m from Sturgis, South Dakota) kept on bugging me about, “So what can you do about the bluing on motorcycle pipes?” For 3 years I kept telling him I don’t (care about) bike pipes, but I know it would be easy. You see, what makes a high quality emerald green is it’s chromium content percent backed by beryllium crystal refraction. Too much Oxygen vs. less beryllium content percent and less chromium percent is what spoils them until they come out gray to clear. Pure chrome cannot be seen because of its refractive angle in relation to human eyes. Chrome mined in nature comes in rock form, stable, complete with oxygen molecules attached (chromium oxide), which comes in beautiful colors, with the refractive angle pointing right at the human eye. You can see it. So when we chrome bath something, it is without oxygen. Pure chrome pipes are man-made crystals that can’t be focused on by a camera or your eye, you just see reflections refracted of everything else in the room! So this biker leaves his choke on or the bikes running rich or its out of tune, he stops at a stoplight, BAM! blued. Why? Because that beautiful pure chrome crystal on that pipe reaches the perfect temperature in an oxygen atmosphere, (air), and one tiny single layer of oxygen molecules that are about a millionth the thickness of an RCH (smallest measurement seen by the human eye) attach to the pure chrome crystal surface of the biker’s pipe (I know, I know, everything is a crystal or an RCH to me). Now covered on oxygen, the refractive angle of the pipe chrome crystal is changed and the light points directly at the human eyeball, and you see the chromium oxide crystal’s beautiful colors, blue, brown, gold, etc looking through that oxygen molecule layer. 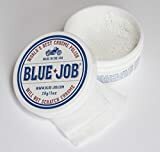 Blue-Job powder has several secret parts to its design, and since you’re a nice guy I won’t tell you about them, (you know what I would have to do), but I will tell you it is electrically charged and super hungry for oxygen molecules. That’s why you have to rub the oxygen molecules off and on to the magic powder. Look at the cloth after you are done. Oxygen looked at, with chrome backing it, looks blue, gold (brown), purple etc. The cloth is black when you are done. Why? Because pure oxygen concentrated is black colored without chrome behind it. There is no chrome on the cloth because Blue-job is an oxygen sucker (de-oxidizer), not an old fashioned abrasive polish. It only removes the oxygen, not the chrome. 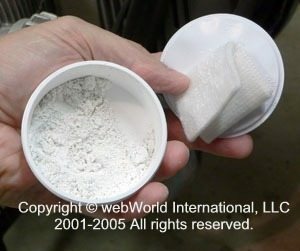 So one day my buddy grabbed a baggie of my secret emerald polish powder off my desk and said, “lets go down to the local bike shop.” I said, ok.
We arrived and my buddy told this old timer mechanic that his crazy (Me) scientist says he can get that bluing off your pipe without scratching it. I said, “Ok, no problem”. I went over and spit on his bike chrome, then spit on the gem cloth I was using, then dipped it into the baggie of magic white powder. I rubbed one spot the size of a nickel real hard, wiped it off, and stood back. The spot looked like new. The old biker actually fell backwards over another bike cussing and saying “Get me some of that (stuff), I can sell the (heck) out of that (stuff)! We picked him up off the floor and promised to get him some soon. That night I was dreaming I was in this Asian painting in a row boat, and out on the South China Sea, big waves and whitecaps. Me and a friend were rowing in the dream painting off Vietnam’s coast and suddenly we saw this beautiful lady riding on a dragon on the waves. I recognized her — Guan Yin, Goddess of Compassion, Mercy and Kindness — considered to be a mother-goddess and patron of seamen. I told my friend, “Hey, it’s the goddess of seamen, lets row over to her! She held a jar in her right hand. When we approached, she held out the jar to me and I read the word on the label, “Blue-Job”. I knew this was a great dream, but I forced myself to barely wake up and write it down on a notebook beside my bed on the table. I fell asleep tossing all night, wondering if I really wrote it down. 7AM the alarm went off and there it was! Blue-Job! I told my friends what happened, and they all advised me to not do it. I told them, “Watch me”. Blue-Job is now sold in over 40 countries. Blue-Job Chrome Polish and my gem cloths, Blue-Job Pipe Wipes, specially designed for precious chrome, are Made in the USA. All factory workers who make Blue-Job Chrome Polish products are, and must be Disabled American Veterans. The best! From “B.K.” (6/09): “Hi, I just finished reading the Blue Job exhaust pipe cleaner product review by Bill W, if I remember correctly, and he asked the question ” if anyone knows what the golds are”. Blue Job wont remove the blueish gold from my Harley chrome exhaust pipes…rubbed and rubbed. Waste of money for me.